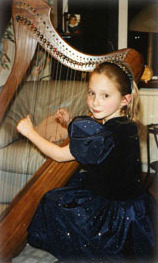 As a harp teacher, Geraldine is fully qualified and experienced. She trained as a teacher at St. Mary's College, Strawberry Hill, Twickenham specialising in Music before going on to the Royal College of Music for a further four years of study. She has taught in the State and Independent Schools system, having taught for Hertfordshire County Council and at Abbots Hill School and Bedford High School for Girls. She teaches privately from home, with her pupils ranging in age from 5 years to 65+ !! Her pupils have achieved a 100 per cent pass rate in the Associated Board Music Exam system with 75 per cent gaining merit or distinction. There has never been a better time to learn to play the harp. The general interest in and demand for the harp is growing as is the amount of harp music and the number of harp societies and harp festivals. Is the harp difficult to learn to play? No, the harp can be approached like any other instrument. Once you learn the hand positions for correct and comfortable playing you become more skilled with practice. In fact, unlike some instruments, the harp makes a beautiful sound from the very first steps of learning to play. The easiest of tunes sound lovely. So, it's a great pleasure for all who hear it! 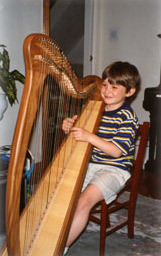 What age can children start learning the harp? Depending on the child, some can start as young as 5 or 6. They can learn the basics of music through learning to play the harp. Geraldine is happy to teach young children. They can start on the harp as soon as they can manage to hold the instrument. Can Adults learn the Harp? Absolutely! If you can play another instrument, you may find it relatively easy to learn the harp. Adults tend to be self-motivated and keen when it comes to practice whereas children need more encouragement (and sometimes bribery!) If you don't play another instrument, you can still learn the harp. It may be a little slower, but the satisfaction and sense of achievement is great! There are several options when it comes to finding a harp. As a beginner it may be best to hire a harp. You can then take your time about deciding what type of harp(and there are many) is best for you. Also, it is initially a smaller financial outlay than buying a harp. Geraldine has several small harps which she hires out to pupils, or she can advise you on other hiring sources. You may decide to buy a harp. It is best to seek advice on this. Depending on the size of the harp, the decoration and the quality, the price of new harps can vary enormously - a bit like cars: from a 2-door hatchback all the way up to a Ferrari! So do consider your options very carefully. A secondhand harp is one option - harps always keep their value (as long as they are carefully looked after) and with a secondhand harp you know what sort of sound you are getting.There is an extensive list of secondhand harps on www.affairsoftheharp.com in the "Buy a harp" section. What are the different types of harps? The Pedal Harp has 7 pedals around the base of the instrument and these are used to raise or lower each string by a semitone or half-note. If you think of the strings as the white notes of the piano then the pedals make the black notes. You can literally change key with your feet as you are playing the harp. Pedal harps come in various sizes depending on the number of strings-from 41 strings up to the Concert Grand Harp which has 47 strings.